In 2015, The Lincoln Apartments broke ground in downtown Raleigh, set to be the newest apartment complex in the Oakwood neighborhood. At the time, downtown Raleigh apartment complexes were at an all-time high, and The Lincoln faced the challenge of breaking into a product-saturated market. In response, The Lincoln team retained Clairemont Communications to capture the public’s attention and craft a strong debut for the versatile downtown living option. 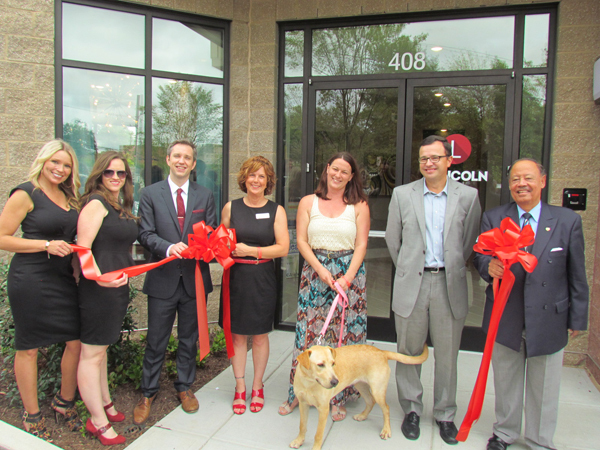 Clairemont Communications captured the community’s attention and generated media buzz for the The Lincoln’s official ribbon cutting ceremony by partnering with Cause for Paws of NC and showcasing the pet-welcoming aspect of the complex. To attract pet lovers and community members to the ribbon cutting, Clairemont planned the event to feature a dog ambassador “cutting” the ribbon. Creative and individualized pitches were used to pique the interest of targeted media and secure on-site coverage. TV stations were invited to participate in “Tag You’re It!” – a social media photo relay – as part of the official ribbon cutting. This photo relay doubled as a fundraiser for Cause for Paws of NC. The event began with the president of the Downtown Raleigh Alliance, city council members and other prominent Raleigh officials welcoming The Lincoln Apartments to the community. After the dignitaries’ remarks, Molly, our canine ambassador from Cause for Paws, “cut” the ribbon by chewing through a treat in the middle of the ribbon. As a part of the “Tag You’re It” social media relay, The Lincoln Apartments donated $5 to Cause for Paws of NC for each participant who shared their photo of the event with the tags #TheLincolnRaleigh and #CauseforPawsNC. – Clairemont met the goal of securing a major television station on-site for the event, which resulted in coverage on air and online. – The event also helped secure four additional media placements, including two print stories, four blog posts and three TV segments. – “Tag, You’re It!” generated more than 70 social media posts. The Lincoln Apartments’ successful ribbon cutting played a vital role in introducing the complex to the community. Additionally, The Lincoln Apartments donated $1,500 to its charity partner Cause for Paws of NC. The work Clairemont Communications conducted in partnership with The Lincoln Apartments earned a Gold Excellence Award in Total Campaign by Raleigh Public Relations Society as well as the Best in Category for Creative Tactics from the North Carolina Public Relations Society of America. We are proud that this is one of the 129 awards we’ve received since starting Clairemont in 2010. To read more about the work we do with clients, please visit the case study section of our blog.